Yesterday, we explored the various qualities of linen yarns in celebration of our week with Fibra Natura’s Flax Lace yarn. Today, we get busy with our needles to make a gauge swatch for upcoming projects that will double as a lacy handkerchief (a perfect “something blue” when made in either turquoise or mineral) for a bride. 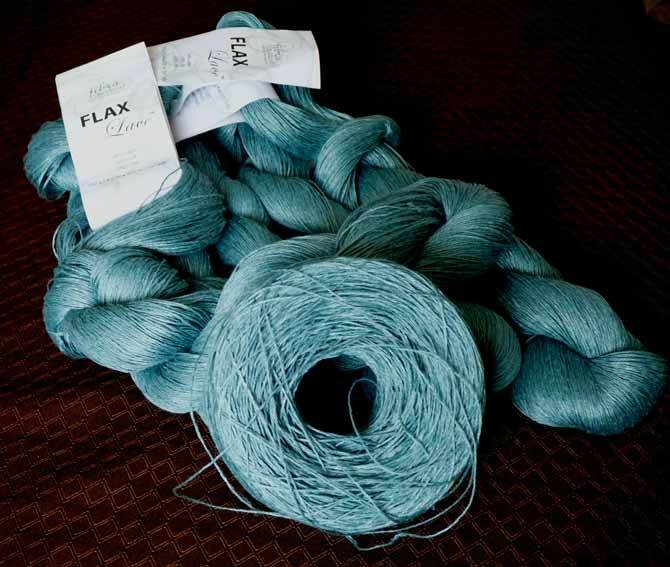 With 547 yards [500m] per skein, there’s enough Flax Lace here to make a BIG shawl for a bride, but today, we’re making a lacy handkerchief that a bride can carry as her “something blue”. In yesterday’s post, I revealed a wedding theme. Initially, it was to be a shaped shawl for a bride, using the horseshoe lace pattern. Giving a decorative horseshoe to a bride to carry on her wedding day is a tradition from Great Britain that symbolizes good luck for the relationship. The shawl will also have a simple seed stitch border to represent rice, another symbol – for both good luck and prosperity. April, however, was a bear of a month, so I scaled my project back to meet the time available. As a result, this week’s project is a stole that’ll make great gifts for attendants, the mother-of-the-bride or the mother-of-the-groom! While waiting for my yarn to arrive, I sampled with sockweight yarn to work out the shaping details. I used size 6 [4mm] needles (my go-to size for sock yarn). My hunch was that when I dropped down in thickness to a laceweight yarn, a size 6 needle would give a sturdy lace with the right amount of drape. My hunch was wrong – which is why we swatch! Both samples were made with the same size needles, the same number of stitch repeats, and the Flax Lace sample has only one additional row repeat. Still, the difference is remarkable — because linen has no elasticity, the sample made from it (right) came up about 10% larger! I made my size 4 sample on straight needles. Its finished tension was 25 sts and 38 rows to 4″ [10cm]. The finished tension on the actual stole, knitted on circular needles, was 26.5 sts and 35 rows to 4″. That’s only 1.5 stitches over 4″, but over 473 stitches, those 1.5 stitches shortens the before blocking size of the stole by 4″ than the results of the sample swatch calculations. The horseshoe lace pattern is worked over a multiple of 10 stitches plus 1. It’s constructed by placing columns of double decreases apart from yarn overs. Serendipitously, this pattern gives the center of our cloth an odd number of stitches, which works perfectly with a seed stitch border. Rows 1-9: (K1, p1) to last st, k1. Row 10 (and all WS rows): (K1, p1) 3 times, p to last 5 sts, (k1, p1) twice, k1. Row 11: (K1, p1) 3 times, k1, *yo, k3, sk2togp, k3, yo k1; rep from * to last 6 sts, (p1, k1) 3 times. Row 13: (K1, p1) 3 times, k1, *k1, yo, k2, sk2togp, k2, yo, k2; rep from * to last 6 sts (p1, k1) 3 times. 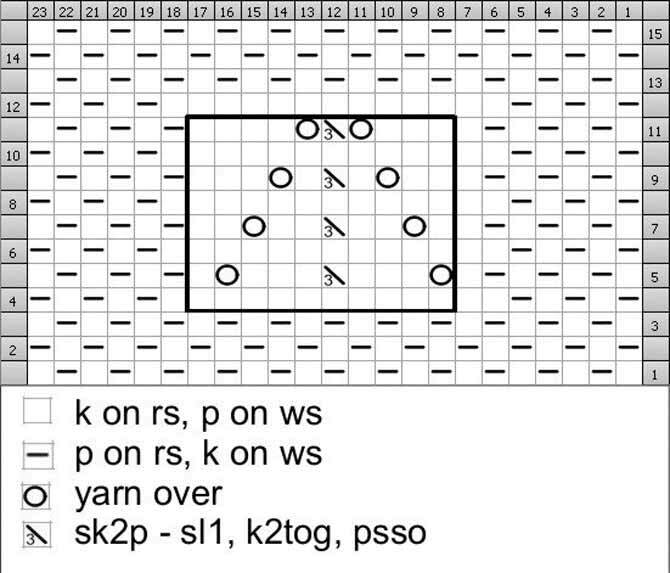 Row 15: (K1, p1) 3 times, k1, *k2, yo, k1, sk2togp, k2, yo, k3; rep from * to last 6 sts (p1, k1) 3 times. 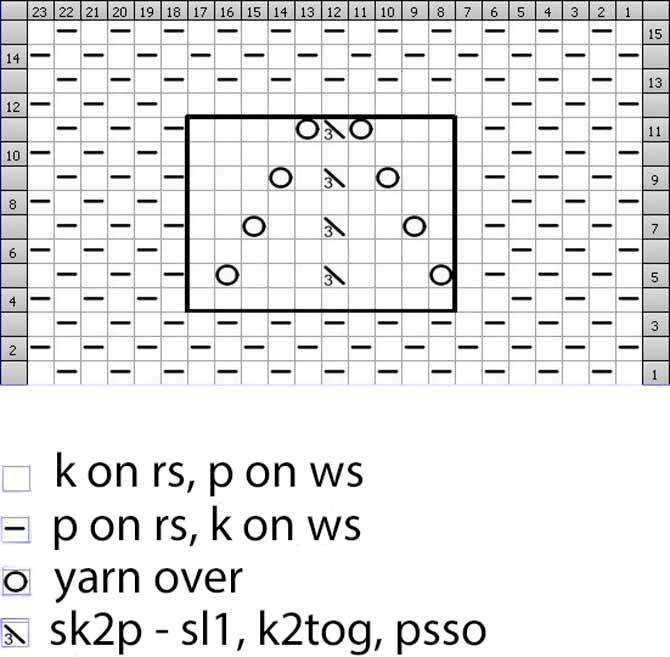 Row 17: (K1, p1) 3 times, k1, *k3, yo, sk2togp, yo, k4; rep from * to last 6 sts (p1, k1) 3 times. Repeat Rows 10-17 until work measures approximately 8¾” [23cm] from cast on. End with a Row 10. Repeat Rows 1-9, cast off all sts. Rather work from a chart? If you’re not used to working with charts, this is a really good one to use for practice, because the double decreases are all stacked one atop the others and the yarn overs are symmetrical, so it’s easy to compare the stitches on the needle to the picture that is the chart. Work rows 1 and 2 4 times. Work rows 4-11, repeating the sts between the dark black lines 5 times. Repeat rows 4-11 until work measure approximately 8¾” [23cm] from cast on. End with row 11. Work rows 12 and 13. Work rows 14 and 15 4 times. Cast off all sts. This is what horseshoe lace looks like in chart form, with a seed stitch border. Did I mention my hunch was wrong? Before blocking, the first Flax Lace swatch was just over 10″ across! I was really unhappy with this result, so I made another, this time on size 4 [3.5mm] needles. Going down just two needle sizes made a big difference: my second swatch wasn’t as open (it’s on the left, below). The swatch made on size 6 [4mm] needles is on the right, and the one made with the size 4 [3.5mm] needles is on the left. 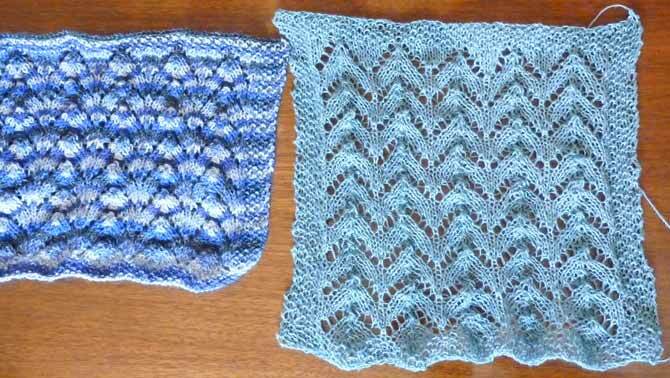 Same number of stitches and rows — what a difference! 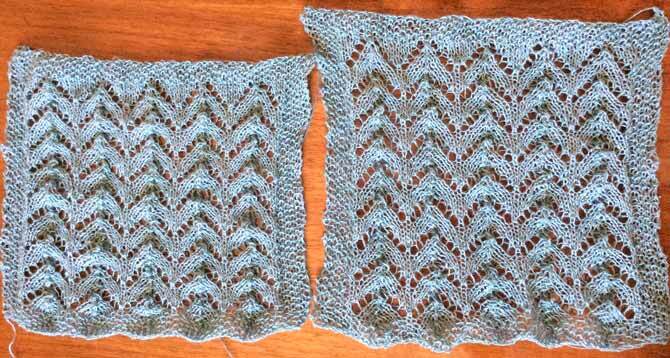 Speaking of blocking, tomorrow, we’ll talk about blocking our Fibra Natura Flax Lace sample – ahem, handkerchief. Go back to part 1: The incomparable sheen of Fibra Natura’s Flax Lace yarn – yum! The incomparable sheen of Fibra Natura’s Flax Lace yarn – yum!